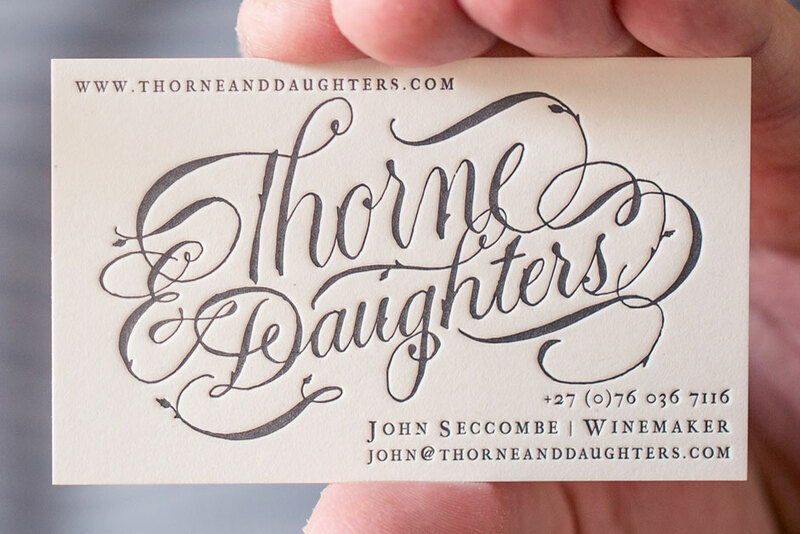 Thorne and Daughters Wines was started in 2012 by John and Tasha Seccombe to produce authentic wines in the beautiful Western Cape. It was with great delight that John and Tasha Seccombe approached us for the printing of their amazing business cards. Below please read their story on how the cards were conceptualized and brought to life. Please visit www.thorneanddaughters.com for the article below. They have a fabulous collection of wines so make sure to check those out while you are on their site. We’ve always wanted our branding to represent our love for things hand-crafted, and to match the care and attention-to-detail that we put into the winemaking. We’ve explored a lot of techniques and materials to really find the elements that reflect our approach to what we are producing. The branding is starting to come together incredibly well now, and we’re really excited to start showing it off. Jan and Rohan at Fanakalo in Stellenbosch have been instrumental in pulling together our barely conceived ideas into something cohesive. We knew from the beginning that we would need their fresh, unfettered approach to bring this all to life. Our business cards are the first manifestation of our new branding, and we are enormously proud of them. We engaged the superbly talented calligrapher, Jane Farr (of Carmel, Indiana, of all places! ), to do the lettering for our logo. It was really important to us that the original was done by hand to achieve the right feel. It is a constant delight that we are able to reach out into the creative world and join forces with skilled people to create what’s in our heads. We’d originally intended to produce our wine labels using the time honoured and wonderfully tactile techniques of letterpress printing, but we ultimately decided to go with a simpler technical approach to the labels due to the complicated logistics of adhesives and curved bottle shapes. 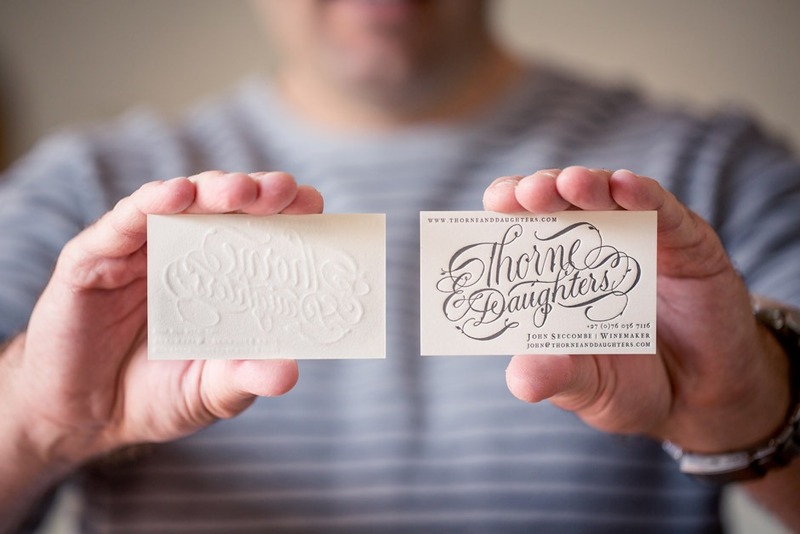 We couldn’t quite let go of the idea of using letterpress, and so we approached the friendly and creative pair of Claire and Chandre at CottonCloud Letterpress to do our business cards. The box of freshly printed cards was definitely one of the best presents for this year! Wow, they just look fantastic and we’ve had such an amazing response from everyone who has received one!